When the support team at ShareMouse first emailed me asking me to check out their keyboard/mouse sharing application, I was skeptical. I am a longtime user of Synergy and to date have found no compelling reason to switch to another program. I felt like there was nothing “broken” in Synergy that needed to be fixed by a competitor. So, when I gave ShareMouse a try, I was pleasantly surprised: I liked it. When the support team at ShareMouse first emailed me asking me to check out their keyboard/mouse sharing application, I was skeptical. I am a longtime user of Synergy and to date have found no compelling reason to switch to another program. And even if I did, I’d probably go with something a little more well-known, like Input Director, or something that’s already been mentioned on groovyPost, like Mouse without Borders. Overall, I felt like there was nothing “broken” in Synergy that needed to be fixed by a competitor. So, when I gave ShareMouse a try, I was pleasantly surprised: I liked it. Update: After reading our review, Michael Schmidt from the ShareMouse Team got in touch with me with a few reactions to some of the points I made in this post. Where pertinent, I’ve updated and amended some of the content to incorporate his input. Want more details? Let’s take a closer look. My tutorial for setting up Synergy in Windows 7 was a bit lengthy. There were a lot of steps. The ShareMouse equivalent will be much shorter. Start by grabbing the appropriate version from the ShareMouse download page (Windows or Mac OS X 32-bit or Mac OS X 64-bit). 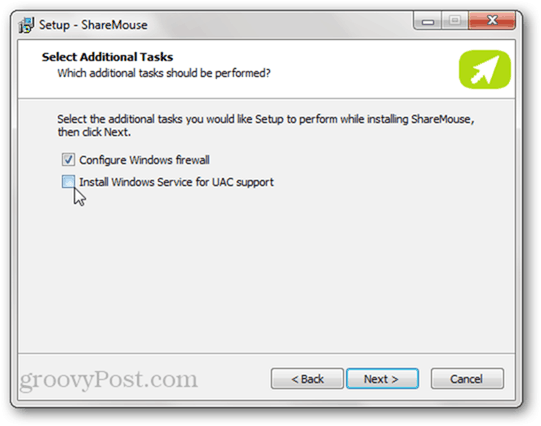 All you need to do to get started with ShareMouse is to install the utility on each computer. Once ShareMouse is installed, the computers will instantly “see” each other on the network and start sharing. The only important configuration options for Windows 7 are these two here: Configure Windows firewall and Install Windows Service for UAC support. 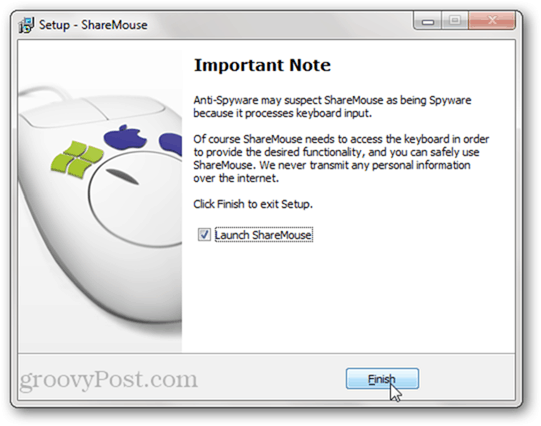 When you are done installing, ShareMouse takes a moment to assure you that, even though your antimalware software might say otherwise, ShareMouse is not spyware and that you should ignore any warnings from your security programs. More on that later. When installing on a Mac, you don’t get the option to configure the firewall automatically. 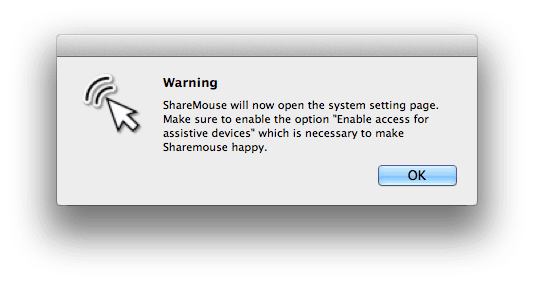 Instead, ShareMouse will ask you to Enable access for assistive devices when you first run ShareMouse. 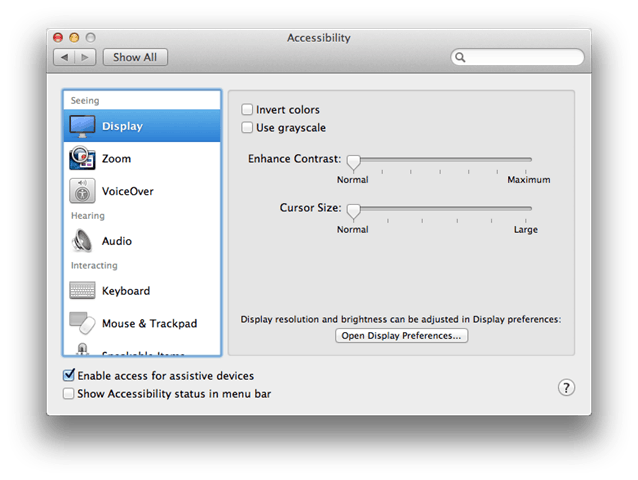 You can find this option by clicking System Preferences > Accessibility. It’s in the lower-left corner. After installing the program on both computers, it’ll instantly begin working. In fact, I was a bit startled when my mouse hopped over to my other computer before I had even configured the screens. ShareMouse made a lucky guess as to how my screens were configured, but you can rearrange where the mouse exits/enters the screen by clicking the Monitor Manager button. 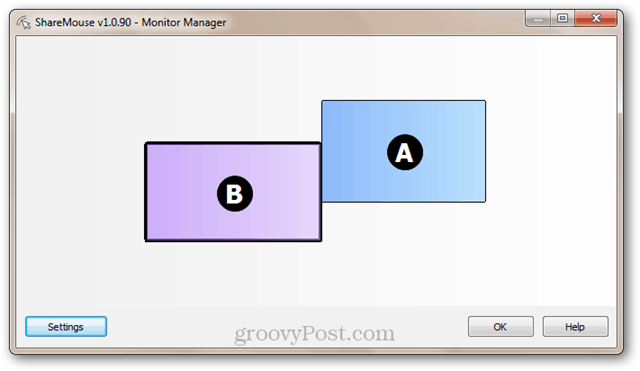 This pulls up a nice drag-and-drop interface for setting up your monitor positions. This is similar to the Windows display setup for multiple monitors and is a bit more intuitive and nuanced than Synergy’s grid-style drag and drop screen link configuration. As you’re doing this, a letter will show up on the remote monitors so you can easily identify them. Those are the essential features you’ll want to configure. But you can also tweak the screen dimming and/or choose a hotkey to switch between monitors. While not a game changer, the screen dimming is a nice touch (and one that Synergy lacks). When you switch between monitors, a big white arrow shows you where your mouse went. Clipboard sharing in ShareMouse is enabled by default. The only quirk is that you must use the hotkey to paste a shared clipboard, rather than the context menu (Edit > Paste). You can set it up in the Data Exchange pane. Update: Michael from ShareMouse points out that this isn’t a quirk or a bug; it’s a feature. 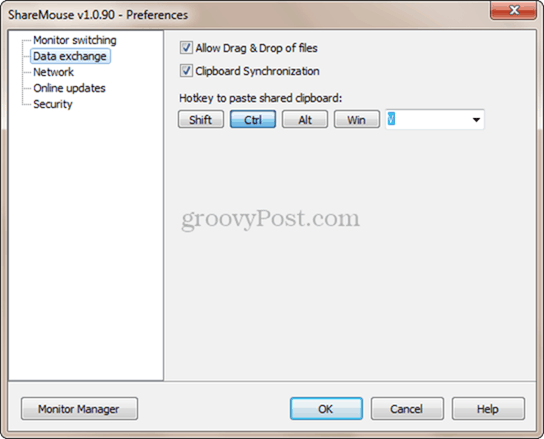 Assigning a hotkey to your shared clipboard lets you distinguish between whether you want to paste from your local clipboard or the shared clipboard. Good point. You can also drag and drop files from one computer to another. I tested this out by dragging a couple of images from Mac OS X’s Finder into Windows Live Writer. It worked flawlessly. However, according to ShareMouse’s documentation, dragging and dropping files doesn’t work if you run ShareMouse as an administrator. I haven’t tested that out, but if that’s true, then it’s another good reason to leave the UAC service option unchecked during installation. Update: I sort of jogged over this point quickly without getting into some of the handy applications of cross-platform dragging and dropping. Using ShareMouse for popping one file over to another machine is much easier than what most of us have been doing—e.g. transferring via Dropbox, emailing ourselves attachments or copying to a thumb drive. ShareMouse’s drag and drop file transfer is considerably cleaner and less cluttered than those methods. ShareMouse’s automatic configuration might be an issue if you want to limit control of your computer to only a few machines on your network. To remedy this, ShareMouse allows you to enter a password for each machine. Only machines that have the same passwords will share their keyboard and mouse. You can also enable data encryption, which might hinder someone on the network who is trying to intercept copied and pasted contents or log keystrokes. Update: What follows is a discussion about the information that ShareMouse collects about its users. Michael from ShareMouse was a bit taken aback by my heavy focus on the possible privacy implications that come with using ShareMouse. I can’t blame him for that. But I would like to note that I—like many other groovyPost contributors—make a special effort to highlight any possible privacy or security concerns as part of all software reviews. It doesn’t matter whether it’s Google’s Picasa, Facebook’s iPhone app or something by an independent developer. We know we are being paranoid about this. And we don’t mean anything personal by it. But we’d like to give as much information as possible while letting the readers decide. Above, I mentioned two things that I would talk about later. The first was the price, and the second is the claim that ShareMouse is not spyware. These two items go somewhat hand-in-hand. ShareMouse is free for personal use. The big limitation to the free, unregistered version is that you can only use it with two computers. In addition to the two computers limitation, there are a number of other caveats that are meant to distinguish between a personal user and a “pro or power user.” This includes things like support for server operating systems (like Windows Server), support for more than two monitors total, the presence of a domain controller on the local network or “use of software which is typically used in professional environments.” That’s all well and good—I appreciate that the makers of ShareMouse would want to be paid for their hard work if it turns out that their software helps you make money. But the way they determine whether or not you are a power or professional user is a bit…funny. 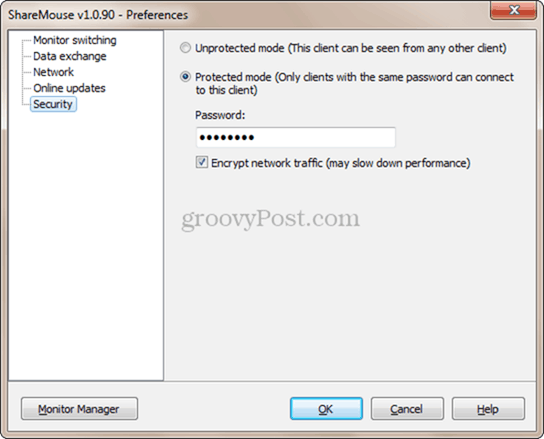 Rather than operating on the honors system or requiring a license key to “unlock” support for the abovementioned system configurations, ShareMouse works by automatically detecting pro environments. For example, if it notices that you are running AutoCAD or Adobe professional software, it’ll kick into “demo mode.” Demo mode works as normal for a few minutes before deactivating keyboard and mouse sharing. You can reactivate it by restarting ShareMouse. The power/pro user detection is performed completely internal on your own computer. ShareMouse never collects or transmits personal information over the internet. Period! That’s not to say that ShareMouse doesn’t collect or transmit any information over the internet. According to their End User License Agreement (EULA), ShareMouse does phone home with your “license key, time/date of access, hardware ID and IP address for a limited time on our server for security reasons and to avoid software piracy.” This happens whenever you check for updates or register a license key. Update: Michael from ShareMouse points out that this is standard practice and is shared by Windows, OS X, DreamWeaver, etc. He also notes that there is an offline registration process available. All of that is strictly for your information. In spite of all the time I’ve spent examining the privacy and security considerations, I will say that personally, I would not feel uncomfortable using ShareMouse based on what I discussed. What would stop me, however, is the price. ShareMouse is $24.95 per license. And you need one license per computer. So, at a minimum, you are paying $49.90. But considering that most people who will feel the need to pay for ShareMouse are those with more than two computers (since you can use two machines for free), then realistically, you’ll be buying three licenses for a grand total of $74.85. Again, we never collect, share or sell confidential information. Period. Another period. And for paranoids a bonus period: Period. However… bundling software with 3rd party toolbar browser “add-ons” like Synergy does certainly compromises user’s privacy: It’s the sole job of “browser add-ons” of this nature to collect, share and exploit user’s data! We are approached by the toolbar installer bundling mafia on a regular basis but always rejected them …for privacy reasons. In my opinion, the free version of ShareMouse is a very good value. It’s much more user-friendly than Synergy, so much so that I wouldn’t hesitate to recommend it to some of my less tech-savvy family members. But as someone who frequently uses two displays on one machine (whether it’s another monitor or a TV via HDMI out), the free version simply won’t work for me. I’d much rather use Synergy for free. I think other “power and pro” users would agree—especially since the types of people who tend to have multiple computers and multiple monitors are usually geeky enough to navigate Synergy with ease. Overall, I have to congratulate ShareMouse on creating a keyboard and mouse sharing program that is more user-friendly than Synergy. But if I could give some feedback to the makers, it’d be to make the pricing a bit more accessible and the mechanism for enforcing the licenses a little bit more conventional. Can ShareMouse send Ctrl-Alt-Del to a second screen? I can’t seem to find any working combination. Also, sharemouse requires to be run as admin if it wants to interact with higher privileged screens (i.e.Windows Services). My understanding is that CTRL ALT DEL in Synergy either doesn’t work or doesn’t work all the time in Windows 7. I’ve seen some workarounds out there. I will try them and if it works, I’ll write a tutorial. CTRL-ALT-DEL is grabbed from the remote controlling PC’s OS on a very low level. We will add a customizable hotkey for this action in a future version. Please do an update for version 2 of ShareMouse. I almost didn’t even bother with looking at the product site after reading this review because of the expensive pricing model and the few unsupported features. I’m really glad I did because the company listened and is now 75% cheaper and a bunch of great feature requests implemented. Thanks for the original insight thought! Yes, since v3, you can trigger ctrl-alt-del on the remote pc. CTRL+ALT+DEL works fine in Synergy, I think it’s been fixed in the current release. You may have to remap your buttons – but it definately works unlike sharemouse. Good to know, I haven’t tried that yet. Input Director – CAD works on all windows XP, Vista, Win7. Didn’t try on win8 yet. But clipboard keeps crashing on me. Share mouse is a good program for 2 monitors but it fails to be a useful product because of their overzealous licensing. First of all, its stupid. If you have 2 monitors, it’s free. But if you have 3 (I have a dual monitor mac and a single mac) then you have to buy 3 licenses. So the minimum cost is $75, which is simply 2 much. This, coupled with the idea that if I want to link another system, I’d have to buy another license. I got a bad taste in my mouth using their demo. Unlike most demos where they allow you to use it for 15 or 20 days, theirs stops working after a few minutes. So after spending the time to configure the 3 monitors, it stopped working just as my softphone was ringing, and my keyboard couldn’t reach the system. At that moment, I stopped considering buying the product and I re-installed teleport. Since there are 2 free alternatives, I wouldn’t use share-mouse even for free. Most systems support dual monitors, so if you want to add another in the future you’ll have to get used to a new program unless you want to pay $75 for share mouse. They argue that their market is small so they have to charge alot. Well guess what? the “market” for a $19 product is vastly larger than the market for a $75 product. It’s called elasticity of demand. At $75 I’m surprised there’s any market at all. “Useless”? Great smoked kippers! What’s the big deal with Ctrl-Alt-Del ? I mean, why can’t you just lean over a few inches to the relevant keyboard and Ctrl-Alt-Del from there? I mean, how often do you need Ctrl-Alt-Del in any case, for cripes sake? Or am I missing something? Is Ctrl-Alt-Del cipher for something else? I’ve just spent 4 hours trying out ShareMouse, Synergy and Mouse Without Borders (which is also free). I’m a developer and I’d say I’m quite comfortable with all manner of technical things, but I simply could not get Synergy OR Mouse Without Borders to work (despite a great deal of effort). Share Mouse is the only one that’s been of any use to me so far. I’m using it at home at the moment with 2 machines, but if it proves to work after a few days I will definitely buy the licences and use it for 4 machines at work. The only annoyance I have found thus far is that despite ticking the box for UAC support during installation, this feature just doesn’t seem to work. When I move the mouse onto a screen that has an UAC-type dialog, the application just freezes. This is nice software and these guys deserve some funds to keep improving it or to reward their efforts for creating it. It is 10X cheaper than a KVM hardware solution and to get a KVM that works between a mac and a pc or a mac cinema display and a pc display is really crazy expensive. This product and takes up no desk space and uses no resources that will probably end up in a landfill later as technology changes. Yes, you can compare it with free, but if free means you spend more than 15 minutes configuring and installing, I’m willing to bet that I can pay you more than $50 for that time to do something more productive (doctor/lawyer/teacher/etc.) If you need a kvm, buy it. I’m impressed. Only thing I really would like is to be able to move a window from my mac to my PC and vice-verse (extend desktop feature like maxi vista but for a mac as the host). Seems that Avatron makes a nice product called Air Display. One version of Air Display ($9.99) you can buy for your iPad/iPhone. Plenty of reviews for that setup are available. The other is for your mac ($19.99) and enables you to use the mac monitor as a display for your pc. It plays nicely with sharemouse. It works nicely with the multi-desktop of the mac. 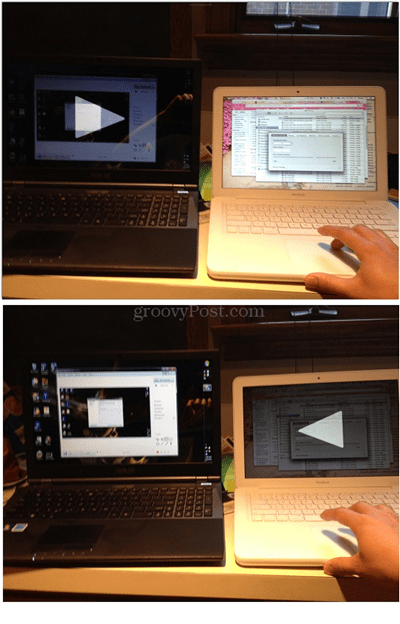 Simply expand the Air Display window into full screen mode and then you can use your mac touchpad to swipe between your mac desktop and the extra desktop for your windows PC, still using the same keyboard and mouse via sharemouse. Still, I would like somebody to engineer a software that allows me to use any input device with any output device on any computer on the network and give me a simple, single config panel for all of it. Inputs: Keyboards, mice, touchpads, iPhones, iPads, microphones (even if attached to the iPhone). Outputs: Headphones, displays, iPads, iPhones. Both of these companies seem to be getting there, but I still can’t drag a window from my mac to the pc. I could setup a vnc type setup on the pc to view the mac, I suppose. But alas, enough for today. Thanks for the review of this sharemouse product. I find it useful. Hope the discount coupon and the ideas for Air Display are useful for some other people. Big problem… Mouse without Borders Service stops. If I restart the service, it stops again after a second or so. Something is preventing the Service from staying loaded and running. I just wanted to say my bit about the AVG Toolbar that was very briefly bundled with Synergy back in 2012 when this article was written. We removed it! :-) Quite some time ago in fact. After including it with 2 versions, we decided it wasn’t the right way to raise money for open source. The bundled installation was optional, and was easy to avoid. Approximately 0.05% of our users installed it according to the statistics we got from AVG, and around 90% of those users uninstalled it afterwards. So the “damage” was very minimal and is often exaggerated, massively. I do admit though that it was a mistake to bundle the AVG Toolbar with Synergy, and we later found a better way of raising funds for our project. @nick Bolton: Thanks for the update! We look forward to checking out the new features of Synergy that are coming soon. Nick, it looks like you could achieve your goals easier if you would just buy a Sharemouse license. Ah, you’re so right, Frank! And maybe Canonical Ltd should just buy a Windows license instead of trying to improve that silly Ubuntu thing. What about Oracle? Wasting their time on developing MySQL! Just buy a Microsoft SQL license. And Mozilla, what a waste of time Firefox was, right? You don’t even need to buy a license to get Internet Explorer, why bother? * You charge users for having bugs fixed. Wait. It’s even worse. You take money not to FIX bugs but just to allow us to BEG (‘vote’) for a fix. How easy! All the money, no obligations. Come on. The stuck modifier key bug is age-old and you will never fix it because it’s your cash cow. We don’t pay you to carbon copy other software. We want Synergy to be stable. Finally! * You make money by compromising computers with crap ware installers and now even ridicule legit complaints? Your selfish attitude ruins the spirit of oss. * Users must donate to have all advertised features which makes Synergy the world’s first feature crippled open source software. This is beyond ridiculous. As a nerd you believe it is about features. But users don’t leave Synergy in favor of ShareMouse or Input Director because Synergy lacks features. Synergy lacks quality and genuine open source community spirit. It is not a good idea to turn a small oss project into your personal commercial business. You are killing it. And before you kill it will be forged and that forge will kill your business. That is why it will not work out for you. Drag and drop will be Premium-only only until it’s more stable, then we plan to release it to the public (actually you can very easily comment out a line to enable it). This is the only Premium-only feature. Contrary to what you suggest, this is not a scheme to make money at all, we simply want to limit the number of users testing it to those who love Synergy enough to back the project. In fact, most people donate because they want to help out the project succeed — we don’t really get that many people giving us money to unlock features. I’m flattered that you think drag and drop is so valuable that restricting it to Premium-only users is “crippling” the software, you must really love that feature! As for the Premium votes, again, not that many people actually use their votes, most people just want to help out the project. The AVG Toolbar was a very brief mistake, which we quickly corrected. Why must you insist dragging up the past like that anyway? It doesn’t really achieve anything in this context. As I said in my earlier message, the AVG Toolbar thing is massively exaggerated (often by people like you), it was optional, and easy to remove. Whatever your reasons for being so insanely bitter about Synergy or open source business, just let it go — its really not worth getting so aggravated about. Maybe you should go outside for a bit? Synergy is not open source. To Nick Bolton the creator of Synergy – I agree with the previous post by Frank open source software at least in spirit is about being free and open; this would fall under a proprietary licence being the opposite contrast to open source. If you are going to continue using the open source definition to define your software. I really think you need to revaluate your initiative here. Most of the software where I have used especially on source-forge is completely free and the authors do not charge a single cent. Here is the definition of open source as provided by the Open Source Initiative – Open source software is software that can be freely used, changed, and shared (in modified or unmodified form) by anyone. Open source software is made by many people, and distributed under licenses that comply with the Open Source Definition. Synergy is still open source, and will always be! Just to clarify, when they say free, they don’t mean like “free beer” (its more like “free speech”). When you download the Synergy source, you can modify it, redistribute it, and use it for whatever you like! Synergy now charges for even downloading the executables. IMHO, it is sarcastic to call Synergy free by throwing the raw source code at us. I switched away from Synergy as it lost its OSS spirit. Sam, its a common misconception that in the open source world “free” means “free beer”. So you’re not alone with your beliefs. The whole point in free and open source software is not to make the binaries available free of charge. What you’re talking about is known as “freeware” which is not the same thing as “free software”, not even closely related despite sounding similar. Nick, the FOSS community sets your attitude straight. That’s seems only for Mac, not a real true FOSS alternative for Synergy. Looks like there is no traction enough to fork Github Synergy code and create a true alternative with easy and stable builds for pedestrians. As stated on their support page, they won’t reply to support requests for non paying customers. Unfortunately they won’t even reply with a simple ‘we are aware and are working on it’. Please note hat we are located in Germany with eventual time shift between locations. As you realized, it is common sense to serve freeware users are limited. However, we read every email and if we need additional information, we will follow up of course. @Bartels, yes you did reply. But your reply was just a link to the manual and did not acknowledge whether issues are known and being addressed. Again, I understand your policy is not to reply to non-paying customers, and I appreciate you even writing back. Truly. That being said you did not respond to my second email in which I asked if someone could simply acknowledge if these issues are being addressed. Thank you for not posting my email address. Sorry, lack of linux support is a deal breaker for me. Dumb question I’m sure, but is Sharemouse a fork of Synergy? Harry, not a dumb question at all! Actually a very good question. Synergy was written first and has always been open source, so the question makes perfect sense. Nick, thanks, but sadly decompiling and comparing code is way beyond my capability. I’m a simple user, not a skilled coder! I have about the same problem as Jason above, but i’m a paying customer and on a PC. ShareMouse just locks up my USB, it does this randomly. It’s been frustrating. I contacted support. First email i never heard a reply. Then the second email they sent me a link showing me i was suppose to give them all my serial code and other info, which i did in the first email including a well thought out description of the problem. Contact through email wasn’t easy. I called their number and left a pleading message that i needed help for my paid version of ShareMouse. In the end i finally got a response in email, they wanted me to help them diagnose the issue. I really was out of patience and dollars with ShareMouse, i had already spent too much time trying to make it work, i needed to get to work. I’ve used Multiplicity 2.x for years, but it start throwing a harmless error here and there but functioned fine. I thought i’d look around and check my options. ShareMouse initially seemed perfect, but where i screwed up was testing it for 20 minutes and thinking all was well. That’s why i bought it. Now it just locks up my USB randomly. It was a waste of money. I’ll be sure to pass that on in my professional forums. I just downloaded Multiplicity 3.x. I’m hoping this works out fine andif so i’ll upgrade to it. I’ve been using Multiplicity 3.x for a few days now and everything has been fine. On a side note, one feature or functionality difference i’ve found between ShareMouse and Multiplicity is that when you get to the login screen, Mutliplicity is functioning, so i can use the one keyboard and mouse to login on either system. With ShareMouse, i had to login with the keyoard and mouse physical connected to the particular system i’m logging into. This problem with ShareMouse is either that ShareMouse is a USB glitchy problem like i’ve discovered elsewhere on my system, or it doesn’t remember the monitor layout after a reboot (i.e. is sees the right system monitor as above or below or wherever, but not in the place it was when i rebooted). I did find problems with it remembering monitor layouts. 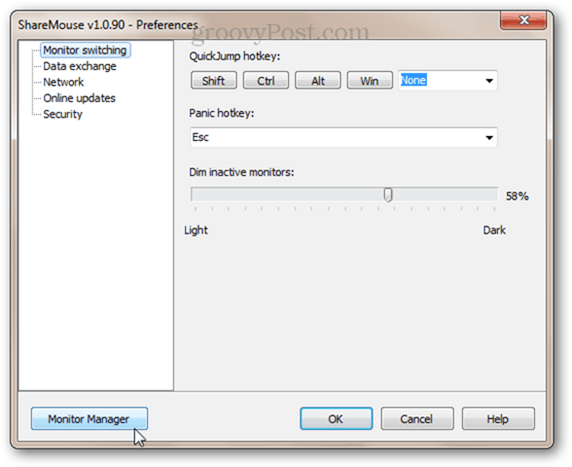 It’s suspicious that ShareMouse has a shortcut for in case of emergency, to disconnect the keyboard and mouse sharing (as if it is a known and potential problem). I don’t remember seeing such an ejection seat setting in Multiplicity 2.x and i couldn’t find one in 3.x. Yes, I do see that delay occasionally, but not always. I recently purchased both and tested each for a week between a Win 8.1 and a Win 10 computer. ShareMouse’s interface is nicer and there are more options like being able to change the monitor placement, and the drag-and-drop feels better and works more reliably (this was my main reason for considering ShareMouse). But for basic mouse & keyboard & clipboard, Synergy works better. MUCH better. It’s more reliable, there is less lag on the client machine, it deals with my different monitor pixel densities much better, there are fewer problems with copying text to the clipboard. With Synergy I forget these are even two different computers. Synergy is also cheaper and open source. It was the clear winner for me. Question. Does this program suffer from the client panning acceleration while in games that Synergy does? If you are unaware of what I mean, in a nutshell, when you have two computers running synergy and are playing games on the PC’s. A lot of MMO style games let you click and hold down the right mouse button and use the keyboard to pan, turn and other functions. With Synergy, when holding down the right mouse button and trying to turn (to run at an angle) the action is amplified 1000 fold, making it unusable and forcing you to use the keyboard to turn left and right, which is slower. Has anyone that has tested this software tried this and found this issue? BTW in Synergy, if you lock the mouse cursor to the client PC, that panning amplification stops, but isn’t a very good solution because you are often times switching back and forth and locking the mouse slows that down. Just curious, if it doesn’t suffer from that I would consider switching programs since I use it to game a lot and that turning to where it literally spins your character around 100 times before you can stop is annoying at best. Very disappointed with Sharemouse for well over two years now between two Macs. It repeatedly acts up, fails to work correctly and requires endless troubleshooting. Reliable control/sharing does not seem like rocket science, but apparently it is. It is 2016. Software should work. No problems here with Sharemouse and I started using it with v1.0. You have a surprising patience of using sw for “well over two years” while having nothing than “endless troubleshooting”. Well, if you are really a user and dont have another agenda. contact support. They are very helpful. Thanks for a 100% useless response. Who are you and what’s your agenda? You sound the girlfriend or mother of a Sharemouse developer. I want people to know that this is not as rosey as this review tries to make things. I have used Sharemouse and Teleport and they each fail repeatedly. I wrote support a few times, but quite honestly life is too short. No program should require tech support and to me it issimply not worth the time or effort. Same goes for asking for a refund. Now I simply use OSX built in screen share app for my two macs. Free and a better solution. What follows is long. The short version is that while interacting with support I was asked a question about my opinion on how this company administers support. My response to it was intended as constructive criticism, I didn’t make any personal attacks on the person I was interacting with. I merely responded to the question in a measured way, using what is generally socially acceptable language. Apparently my response was seen as merely being rude instead, and caused me to be blackballed by this company. I am posting this here in the event that this happens to someone else so they know they aren’t alone. The long version: Things for me started well enough with ShareMouse. I installed I on two computers, and it worked, so I decided to buy a license and see how it compared for a setup that I had been using synergy to control, that involved 5 systems and 7 screens total. Almost right away I had problems. When I added the first few systems, all was well. However as I went along arranging monitors suddenly my monitors snapped into a weird configuration, where almost all of them show up tightly, as one monitor on the left most edge of the monitor manager, and one of them showed up in the right most edge. There was no way to adjust it, there were just two little circles on each side of my screen. After trying to fix it for hours, I emailed what I thought was support, and asked them if there was a way to reset the monitors. A few days later, after not receiving a response, I looked at their site, and discovered that even though my purchase came with a year of maintenance, we were expected to seek support through a forum. This was something I’m not really ok with. For free software it may make sense to have forum based support, but if you are paying for maintenance as part of your license, then for various reasons that are too long to go into here, forum based support would make more sense. So I emailed this team again, and let them know that forum based support wasn’t acceptable to me and asked if they could help me without going through the forums. The response I received was a promising one. It asked why I assumed forum based support is less helpful, and gave some reasons why bartelsmedia thinks it is better. This was followed by saying there was no problem, they could help me by email instead. In my follow up email, this is apparently where things went sideways. I responded to their question about why I felt forum based support is less helpful, responding to each reason they gave regarding why they thought it was better. It wasn’t a personal attack, I didn’t say anything that was intended as mean spirited, I have been the help desk person receiving these emails in the past and tend to be sensitive to that kind of thing when sending emails. However since they asked for my feedback I gave it. After this I asked for them to let me know how long the refund period for this software is, because to go through the troubleshooting steps they requested, I would need to be in the same physical location that some of the five systems are in. I would also need to pull out some mobile systems that I don’t always have with me, since I am almost always on at my job, and my time with friends and family is precious, I didn’t know when I would have time to go through the troubleshooting steps they needed me to go through. If I didn’t have time to do it before a refund period was over then I would request a refund. This seemed reasonable enough to me. Other than providing some critical feedback (which was in response to a question they asked) I never said anything that I would have been offended to receive if I had been the helpdesk agent. If anyone really wants to know what was said, I would have no problem pasting the contents of that exchange here, it isn’t something I see any reason to feel shame for. However the response I received was that since they have a “nice and friendly customer base, a refund for your purchase is on the way.” They also told me to Uninstall ShareMouse immediately. This response was unexpected, and when I requested further information about what happened, they verified that they thought I was rude and they didn’t want me as a customer. Since I choose to live a life without conflict I asked for them to help me understand what came across as rude so I could avoid it in the future, acknowledged that tone doesn’t communicate well via email, and tried to help them understand my intended tone in the previous email. Being put in confrontational situations like this distresses me, and when things like this happen, I do what I can to find reconciliation (and this isn’t something I would expect to need to do for solicited feedback toward a company). However on their side they have already stopped communicating with me. So the main thing here is to be careful with criticism of this company and it’s way of doing business, apparently they don’t take it well, and saying the wrong thing can turn a helpful tech support team into one that refuses to take your business. Have you requested a refund? Have they refused your request? If not, and if you requested a refund, what be your concern? Have they refused to provide support by email? If not, why do you complain that they insist on forum support as it appears that they have been willing to provide support by email as you reported? Is your concern that they do not offered email support first hand but only after your request? Have you sent them the information they request on their support page? You wrote you dont know when you would have time to provide the information. How shall they help if you dont know when or if at all you are willing to provide the requested information? Sorry but this sounds very confused/confusing to me. Have you sent such walls of text to them, too. If so I could understand that they dont reply. Would you mind going more into detail? I know it is a lot of text this time, I may try to shorted it at some point, when I was typing it, it all seemed relevant. My emails to them were much shorter. More than a couple sentences but short overall. Have I requested a refund? No. Did I get a refund? Yes. This is part of the problem. My concern that they don’t provide email support was addressed and I was happy about this, but I didn’t know when I would be able to send them the information they requested on their support page. This is why I requested information on what the window was for a refund, so if I didn’t have time provide them the information they were requesting, I could request a refund and not risk being left with software that wasn’t working. I was totally game for trying their support steps if time allowed before their refund window closed. Instead they appear to have taken the request for this information as rudeness on my part, and blackballed me as a customer. (They told me this when I asked for clarification after they refunded my money). This was an unexpected negative escalation in our communication and it left me questioning what I did wrong. Finding nothing inherently rude in my email to them I wanted to let others know that if they have an experience like this with their support they are not alone. ShareMouse download page is broken, when is 96% it fails. I think this should be addressed immediately you don’t want to start your experience like this. It seems this article is old (2012? ), but it recently had an update (April 2018), though I’m not sure what the update was. It was not updated to compare the current versions of Synergy or ShareMouse. But because the only date you can see on the article is April 2018 now, it seems like it is a recent review and may imply it is reviewing current versions of this software. The article compares Synergy V1 to ShareMouse V1. Synergy V2 has been out for 6 months now (although still Beta as of May 2018) and it is a complete re-write of the UI, including addressing many of the feature differences pointed out by the article’s author. ShareMouse has also been updated (V3 now? ), but I am not as familiar with it. I think ShareMouse changed their pricing model somewhat, but Synergy is still much cheaper and has a more liberal licensing policy (no limitations of number of computers, monitors, or having to buy a license for each computer). I don’t work for Symless (Synergy), but I’ve been a happy user for many years, and thought it was worth mentioning this. Synergy is neither “much cheaper” and no open source anymore as they hide essential parts of the code as “closed source”. Synergy v2 now phones home to their servers on every connection and they took away the drag & drop feature. I was a longtime customer but because of its very unstable performance (browse their Twitter account to see that I am not alone), “Share mouse” is a clear winner. I really am appreciating Sharemouse…I upgraded to the latest version and Professional, and now I have nearly completely overcome my sad loss of using my iMac as a second monitor for my MacBook Pro. (new iMac’s can’t do it, my old one could). I simply was looking to share the mouse to get a little utility back, and had discounted the copy and paste functions between the two computer, but they work very well on the occasions I use them. What I didn’t realize was that I can now use on Apple Wireless keyboard for both computers now too..it follows which computer the mouse is on. All of a sudden my desk just got a lot cleaner, with less of carpal tunnel from moving between two awkward keyboard placements. Combine that with sharing my files between my computers through the network, and it’s turned into awesome. BN, I did try synergy initially…really hard to set up for the layman. Sharemouse worked great right away.